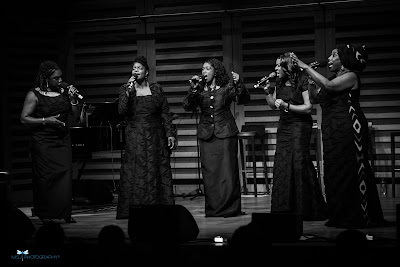 "A reunion with her family and musical roots"
This gig was billed as part of the London A Capella Festival (co-hosted by the Swingle Singers and presided over by Gareth Malone). Allowing for the occasional solo song with piano, the gig fitted the bill. 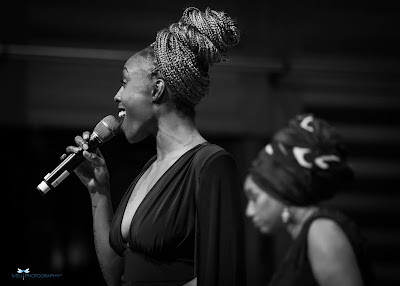 But it was also a celebration of black civil rights, part of Kings Place's year-long Venus Unwrapped series featuring female composers and perhaps most of all, a Brummie family reunion. This was an evening with emotional heft. Black Voices is a five-piece a capella group from Birmingham with an international reputation, founded by Carol Pemberton, who happens to be Laura Mvula’s auntie. She was joined by Sandra Francis, Beverley Robinson, Laura’s cousin Shereece Storrod and Celia Wickham-Anderson. Laura Mvula had sung in the group as a teenager, so this concert was a reunion with her family and musical roots. “A capella” is, of course, a description of a technique rather than a style and it can cover anything from plainsong to hiphop. Black Voices are not a typical SATB line-up. They come from a gospel background and owe a lot to the American group “Sweet Honey in the Rock”, three of whose songs they performed. 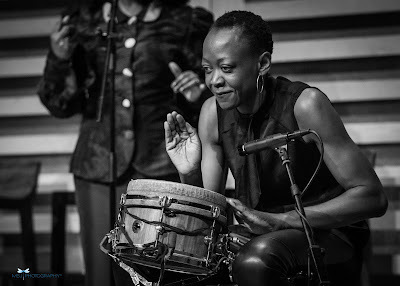 They feature deep rhythmic bass lines, sung like a string bass and, unlike Sweet Honey, Black Voices use a real percussionist (Remi Fadare), rather than a human beatbox. Above the rhythm, the voices swap roles and show an impressive range, although without overmuch top soprano. The singing was accompanied by tasteful but modest choreography. 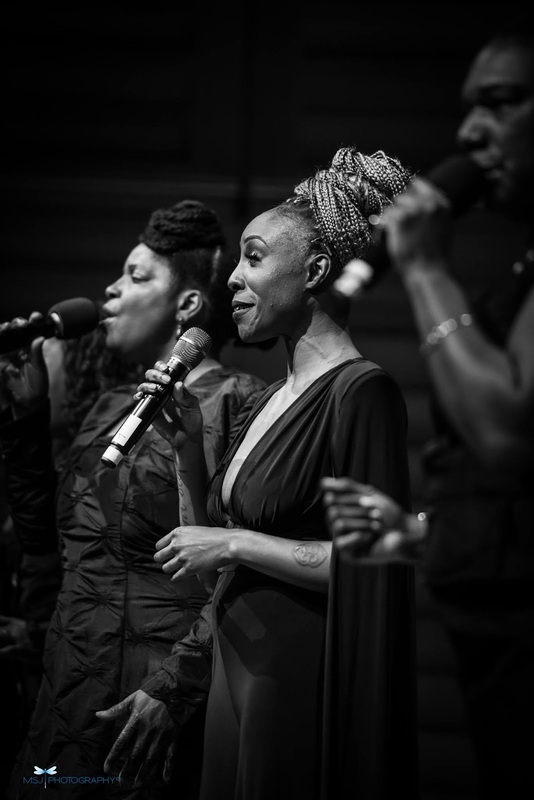 The songs were chosen to suit the occasion, mainly celebrating women’s struggles for freedom, opening with an electrifying version of Nina Simone’s Four Women, featuring Laura Mvula on lead vocals. There were another three Nina Simone numbers and an African song (Anweba) in the same spirit. Less obviously, they also included an Edif Piath number (L’hymne a l’amour), a mock instrumental, and Uptown Top Ranking a nod to the family’s Jamaican roots. There were also call outs for inspirational women figures, predictably Michelle Obama and Laura’s mum; less predictably, Carole King. What of Laura Mvula? She sang three of her own songs solo, (Father, Father, She and Sing to the Moon) sitting at the piano, with restrained backing from Black Voices. Inevitably these were the high points of the night and a demonstration of her power to hold a room spellbound. Just as a solo singer/songwriter, she would be top of the pile, if that was all that she wanted to do. The rest of the time, she was happy to be part of the group, singing and contributing arrangements, and duetting with her aunt. After a bruising couple of years (notoriously, her record company sacked her by email in 2017) it would be easy to write this concert off as a one-off nostalgic retreat into her comfort zone, wonderful though it was. She reminisced about her time in the group, called a capella the purest form of music and said it was where she felt at home. Nostalgic maybe, but I’d prefer to think of it as one of Britain’s brightest (and much-loved) composer/arrangers still experimenting restlessly with ways to present her multi-layered vocals live on stage. There could be good things to follow from this evening.